The defending 3A state champion Boulder City High School girls volleyball team is making a return trip to state after defeating rival Moapa Valley 3-0 in the Southern Region championship Saturday, Nov. 3. (Stephanie Wright) Members of the Lady Eagles varsity volleyball team from Boulder City High School celebrate winning the Southern Region championship Saturday, Nov. 3, 2018, at Pahrump Valley High School. 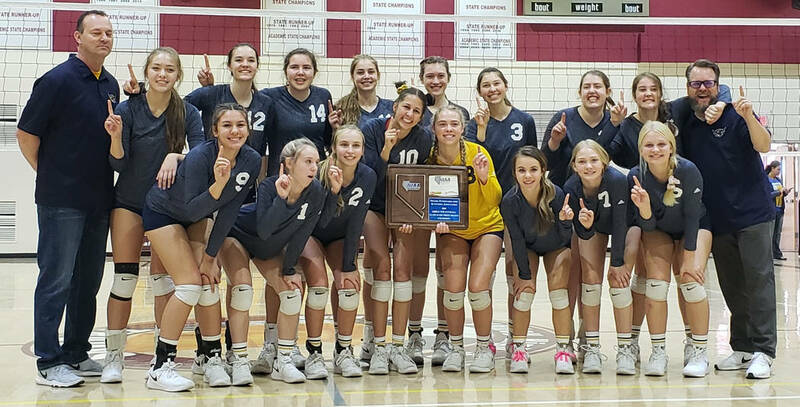 Claiming their second consecutive regional championship, the Lady Eagles routed the Pirates 25-15, 25-14, 25-17 at Pahrump Valley High School. Cruising throughout the regional tournament, Boulder City also swept Valley and Pahrump Valley, making a statement to all oncoming challengers. Taking it to the Pirates early, sophomore Kamry Bailey had a career day for the Lady Eagles with a game-high 20 kills. Helping sophomore setter Ava Wright rack up 32 assists, senior Setia Cox and junior Raegan Herr each added six kills. Playing strong defense against the Pirates, sophomore Rachel Krumm generated nine digs, while freshman Zoey Robinson tallied eight. Defeating Pahrump Valley 25-12, 25-14, 25-19 on Nov. 1, Kamry Bailey had 13 kills with 10 digs. Herr added 11 kills, and Wright dished out 36 assists. Kurt Bailey said he feels his team is up for the challenge of the state tournament after sweeping their way through the playoffs and league play. Starting with South Tahoe on Friday at Bishop Manogue High School, the Lady Eagles will try to win back-to-back titles for the first time in the program’s history. Friday, Nov. 9, state semifinals at Bishop Manogue High School, 110 Bishop Manogue Drive, Reno, 3 p.m.